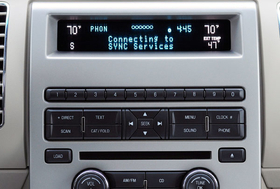 DETROIT -- Ford Motor Co. will expand its voice-activated Sync information service globally beginning in Europe in 2010. Ford CEO Alan Mulally last night revealed the new plans for Sync at the International Consumer Electronics Show in Las Vegas. In Europe, Sync will be available in seven western European languages and three eastern European languages. After Europe, the automaker plans to take Sync to the Asia-Pacific region and Australia. Sync also is getting an array of new features, such as real-time traffic information. Ford introduced Microsoft-based Sync in late 2007 as a hands-free way to operate digital music players and Bluetooth-enabled cell phones. Ford says that Sync-equipped vehicles sell twice as fast as non-Sync vehicles. The company expects to have sold 1 million Sync-equipped vehicles by sometime in the third quarter of 2009. This summer, Ford will add personalized traffic reports, turn-by-turn driving directions and news, sports and weather services. The new services will be available on all 2010 Sync-equipped Ford, Lincoln and Mercury vehicles. There is no additional cost to consumers for at least three years, Ford executives say. Ford is partnering with retailer Best Buy to build awareness of Sync. Technical support will be available through Best Buys Geek Squad. Ford product development chief Derrick Kuzak said Sync will remain an open system that can accept hardware and software developed by other parties. Those could allow Sync users to listen to Pandora Internet radio or to access Facebook messages in their cars, Ford executives said. At the consumer electronics show, Ford also is introducing a display concept that replaces the conventional instrument cluster with configurable controls and digital displays. The concept uses an electronic personal assistant, or so-called avatar, named Eva. Through conversational speech, Eva allows the driver to use voice commands to guide the vehicles connectivity, information and entertainment features, including Sync and the Internet. For example, Ford shows Eva arranging directions to a restaurant and uploading a lunch appointment into the drivers calendar after the driver makes a lunch date. SYNC with Traffic, Directions and Information provides personalized, real-time information to help drivers get to where they're going with information they need. LAS VEGAS, Jan. 8, 2009 – Ford today announced plans to globalize its affordable industry-leading SYNC technologies and services at the Consumer Electronics Show (CES) and introduced new features aimed at further growing its in-vehicle connectivity leadership. Mulally, along with Derrick Kuzak, group vice president of Global Product Development, and top members of Fords Connected Services team, announced a new set of SYNC services that leverage industry-leading voice-recognition software, integrated GPS technology and a customers Bluetooth-capable mobile phone to deliver personalized traffic reports, precise turn-by-turn driving directions and up-to-date information including business listings, news, sports and weather – without the need for a built-in navigation system. Launching this summer, SYNC with Traffic, Directions and Information allows customers to move seamlessly between their home, car and office, staying connected wherever they go. The new service will be available on all 2010 model-year, SYNC-equipped Ford, Lincoln and Mercury models with no monthly subscription fees for the first three years. Ford SYNC is the industrys first system to seamlessly integrate a variety of technologies to provide emergency, diagnostic and information services as well as traffic reports and directions on the road. They include: on-board text-to-speech engine, a customers mobile phone and network, data-over-voice technology, an off-board routing engine and voice portal, text messaging, an existing mobile application and the power of the Internet. Ford is partnering with Microsoft and other recognized companies – INRIX, TeleNav, Tellme (a Microsoft subsidiary), M/A-COM and Airbiquity -- to enable the new services to connect to real-time data. Kuzak said a key difference and an important competitive advantage for Ford is that the company has no interest in developing its own proprietary system. In addition, the SYNC system is upgradeable. Customers can add new features and applications by using simple download features. Plus, all the new features come without a monthly service fee for three years. The success of SYNC is creating demand outside North America. Ford will be making the award-winning system available globally starting in 2010, first in Europe, then migrating to Asia Pacific and Australia. Ford also is redefining how customers react and interact with a vehicles controls and displays, including making voice recognition more natural and conversational. The first breakthrough in Fords Human Machine Interface (HMI) strategy is SmartGauge with EcoGuide, which launches on the new 2010 Ford Fusion and Mercury Milan Hybrids this spring. SmartGauge with EcoGuide is an innovative new instrument cluster that provides real-time information and coaches drivers on how to achieve maximum fuel efficiency in their hybrids. On Thursday, Ford offered a glimpse into the future with a new, more powerful HMI that hints at how Fords future interior environments could function one day. It takes SYNC to the next level through the use of configurable controls and the use of an electronic personal assistant, or avatar, named Eva. Engaged through conversational speech, Eva acts as the liaison to the vehicles connectivity and infotainment features, including SYNC and the Internet. Ford is all about making the journey from point A to point B a more enjoyable and richer experience, with intuitive, easy-to-use controls and voice-activated, hands-free operation, said Jim Buczkowski, director of Electronics Systems Engineering. We want to create a truly rich driving environment where there is no compromise in connectivity – where everything you expect will be at your fingertips or voice command, integrated into your drive with minimal distraction, he added. Ford also announced a new partnership with leading electronics retailer Best Buy, to help build SYNC awareness and provide tech support through its Geek Squad.